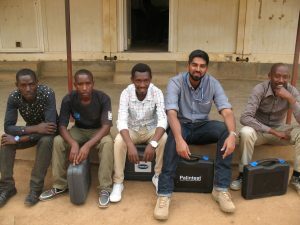 Over the years I’ve spent in the field, I’ve always wondered how we as engineers can better help people afflicted by crisis and marginalization. Some thoughts have come to mind from time to time, but I just wasn’t able to find the right words before. Being part of the Development Impact Lab (DIL) and Global Poverty & Practice (GPP) communities these past two years have helped me to find those words. I learned from the people that DIL brings together—the anthropologists, sociologists, engineers, and economists—how different kinds of knowledge interact and create new ways of acting in the world. I came to see the specific and powerful role that engineers have to play in translating between and hybridizing different knowledge systems to design better development and humanitarian interventions: something we can only we do when we commit to work in solidarity with communities and strive to understand how they themselves know the world. These were thoughts that crystalized as I carried out my postdoctoral research in the refugee camps and then prepared to teach GPP 105. I presented them at the Humanitarian Technology Conference in Cambridge, Mass. in May 2015, and they now form a vision of how I, as an engineer, want to engage in development and humanitarian work in the future. My work is already benefiting from this vision. My postdoctoral project focused on the technical task of developing evidence-based guidelines for emergency water treatment in refugee camps. Now I realize that I haven’t spent enough time thinking about what the refugees perceive and want of their water supply. This is a serious problem because if people don’t like their water, they may reject it and turn to unsafe sources that, in the past, have been implicated in major outbreaks of waterborne disease. I’m now expanding my postdoctoral research to look at refugees’ perceptions and preferences for water supply in displacement camps around the world with a collaborator at Tufts University, something that will help make humanitarian operations more appropriate, robust, and effective. The DIL and GPP communities are true to Berkeley’s reputation for critical and progressive thought, and are helping advance engineering practice for the complexities of the development and humanitarian sectors. The mission and milieu of DIL, GPP, and Cal are now indelibly etched into my work, now and into the future. My thanks to all the people who make for such an amazing place. Imran is now an aid worker and academic focused on humanitarian challenges at the intersection of environment and public health. He has worked as a water and sanitation specialist with Médecins Sans Frontières in South Sudan and Pakistan, and led research with the United Nations High Commissioner for Refugees in refugee camps in Jordan and Rwanda.